By now, you’ve surely heard that Thor: Ragnarok will be a kind of interstellar-road-trip buddy comedy, with Thor (Chris Hemsworth) and the Hulk (Mark Ruffalo) playing the central mismatched duo. This sounds perfectly in the wheelhouse of director Taika Waititi, who knows a thing or two about odd couples. Waititi has teased the ups and downs of Hulk and Thor’s relationship, who will be fighting each other as part of the planet Sakaar’s gladiator games. 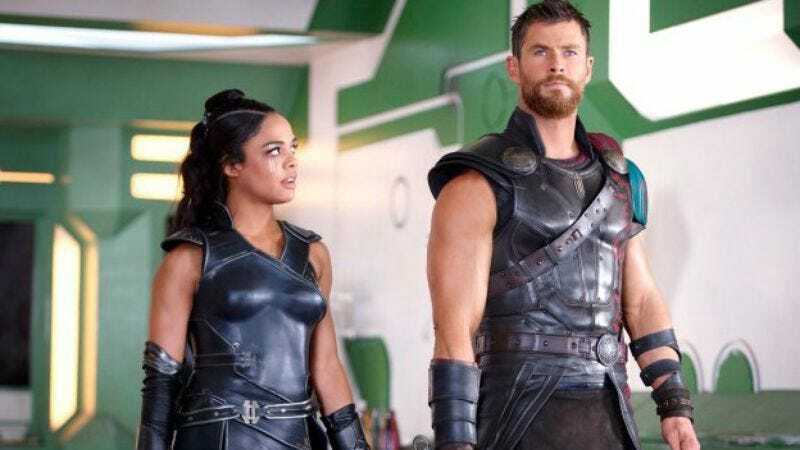 So how does Valkyrie, played by Tessa Thompson, fit into this adapted Planet Hulk storyline? She is, after all, an Asgardian and elite warrior. Well, Thompson tells Entertainment Weekly that Valkyrie will have some kind of arrangement with the Grandmaster, who’s played by Jeff Goldblum. Thompson says that while she can’t go into detail, she can tell EW that she’s the one who brings Thor to the Grandmaster’s attention. I can’t really say much about what she’s doing there but she does have a relationship with Jeff Goldblum’s character—it’s a business relationship. She finds Thor and brings Thor to the Grandmaster thinking he might be of interest. The rest is a secret.